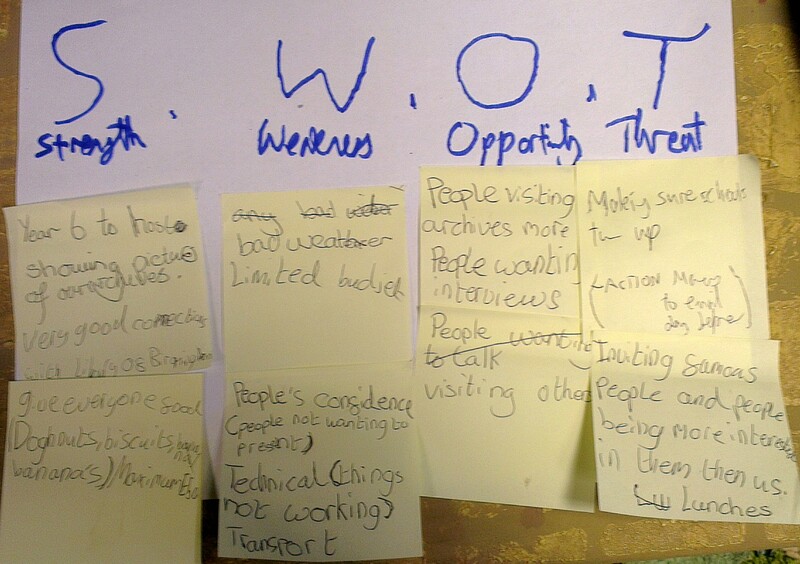 Using our SWOT analysis to guide us, Paganel Archives events team (AKA after-school Archive Club) is working hard in preparation for 10th March Kidsmeet! We have split the workload between the team (three teams to cover hosting (meeting greeting, helping), opening/compare, technical, and grafitti wall/ video room/ interviews). A lot covered in a short time but lots to do – there’s the archives activity (afternoon) and the archives presentation (morning), to work out too. Hectic, but feels like it’s all coming together nicely. This entry was posted in Archive Club, Event and tagged Kidsmeet, Libraries Inspire Learning, Library of Birmingham by youngpeoplesarchive. Bookmark the permalink.